When I think of women and their involvement in American wars, the images that come to mind are typically nurses or Rosie the Riveter. This does make sense, as these are the images that have been promoted: at many of the Smithsonian gift shops, you can purchase Rosie memorabilia, thus making her even more the epitome of women’s war efforts. But women have been more deeply involved than you might have been taught in your average American history class. From spies, to nurses, to factory workers, women have been a part of all aspects of American warfare from the get-go. With the recent announcement of women now being able to serve in military combat roles, it’s interesting to look back at their historic place in combat. Women have been fighting in battles since the American Revolution. Granted, it generally was not known they were doing so, but that doesn’t discount their involvement or contributions. The Civil War, for example, saw a great influx of women joining the military, often disguised as men. It’s quite the challenge to pinpoint the exact number of women who fought in the Civil War. There were at least 250 serving in the Confederate Army with many more probably going undetected. These women were careful to hide their identities, adopting male names and mannerisms. They chopped off their hair, bound their chests, and often covered their necks to hide the fact that they didn’t have an Adam’s apple. The enlistment process was far less rigorous than it is today, making it easy for women to slip into the ranks unnoticed. You would merely have to produce an ID and state your name and job once arriving at the recruiting office. Furthermore, the physical examinations were far from thorough. Most doctors only measured things such as height and checked to see if the recruit had teeth and fingers. I feel like those qualifications would be fairly simple to meet. Once enlisted, however, women had to keep a low profile in order to stay hidden. They became so good at this that they would really only be discovered if wounded or killed. Mary Owens, aka John Evans, for example, served 18 months before being wounded in the arm and discovered. She had mastered being a man. If she hadn’t been hurt, who knows how long Owens could’ve stayed enlisted? I would be curious to see her fellow soldiers’ reactions when they found out who she really was. Some women managed to avoid all detection. 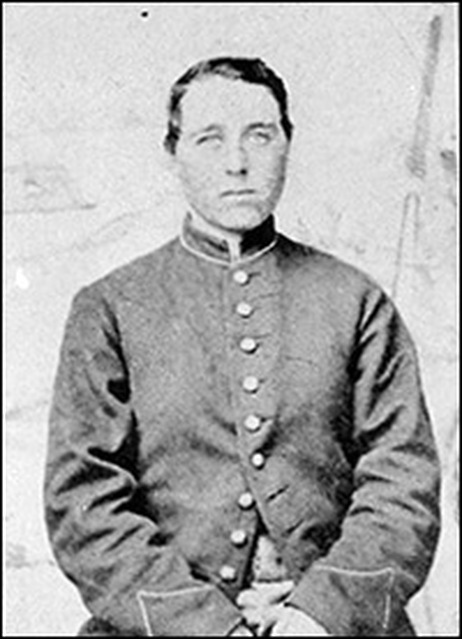 Mary Stevens Jenkins was wounded several times over the course of two years yet was discharged without anyone realizing who she actually was. Jenni Hodgers is one of the more well-known female soldiers. Of the ladies I read about, she stuck out. Hodgers created the identity of Albert Cashier, enlisted, and served for three years, fighting in 40 battles. She was present at some of the major events of the war, such as the siege of Vicksburg. She would then go on to live as a man for many years following the war, only being revealed when she was injured in a car accident. I think it’s pretty cool that female soldiers played a part in Civil War battles. Their presence is a piece of history worth exploring. They fought alongside their brothers and husbands, serving their country proudly. 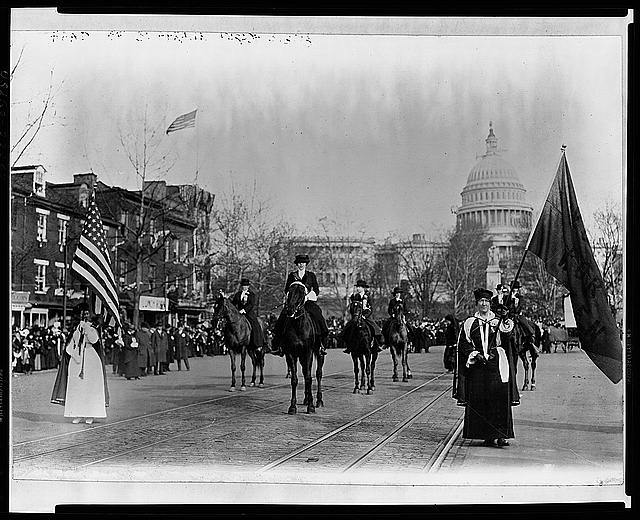 On March 3, 1913, the Women’s Suffrage Parade was held in Washington D.C. On Sunday, March 3, 2013, another parade marked the centennial anniversary of that event. The 1913 parade was an important step in what would be the final decade of the women’s fight for the vote, as it drew national attention towards the cause. The modern 2013 event set out to honor the women who dedicated their lives to the suffrage movement and to remember that historic day. Organized largely by Alice Paul and Lucy Burns, at the time part of the National American Woman Suffrage Association, the parade achieved the desired attention. While featuring over 5,000 women was certainly a draw, the riots that ensued really captured national attention. Male spectators along the route became restless, heckling and jeering at the women. Police officers supposedly protecting the parade stood by, seemingly enjoying what they saw around them, with one even remarking that the women “should stay home where they belonged.” By the end of the day, 100 marchers had been taken to the hospital. 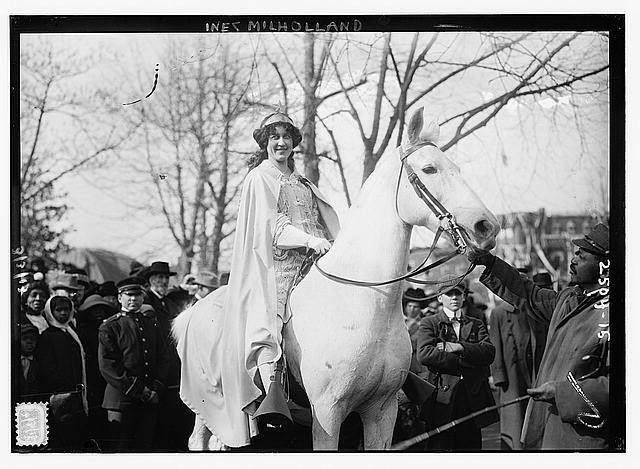 One of my personal favorite stories from the 1913 march was the emergence of the iconic image of Inez Milholland, astride a white horse, leading the parade. Her image would become a national symbol for the suffrage movement and her death on the campaign trail a few years later turned Milholland into a martyr for the cause. She definitely was an amazing lady, clearly dedicated to furthering women’s lives. The 2013 parade traced the historic route down Pennsylvania Avenue, culminating with a rally at the Washington Monument. I was able to participate in the 2013 march, having signed up through the Sewall-Belmont House. It was a surreal experience to know that exactly 100 years prior, women were walking the same path I was. While far calmer and lacking the sense of urgency and tension that permeated the 1913 event, the atmosphere was still electrifying as I gathered with thousands of other women on the U.S. Capitol’s West Lawn before the start of the parade. Women of all ages congregated, from little girls wearing suffragist sashes and clutching signs thanking Alice Paul, to 91-year old Margaret Zierdt, who was determined to march. The parade was sponsored by the Delta Sigma Theta Sorority, with delegations from all 50 states and a few U.S. territories represented. Along with the Sewall-Belmont House, a variety of women’s groups were present, such as the National Women’s History Museum, NOW, and the National Women’s History Project. Some of those marchers were dressed in full-fledged period costumes, embodying the history of the day. For a history nerd like me, it was a pretty amazing event to experience. I love women’s history and had never been around so many people who knew who Alice Paul was or were aware of the events of the women’s suffrage movement. The march was a unifying event for all generations and served as a strong reminder of the women who dedicated their lives to women’s rights. It was so great to see all of the women out on a cold, windy day to honor those that came before them and was definitely a once-in-a-lifetime experience. Editor’s note: Welcome to the first post by one of USCHS’ great crop of current interns. We’ll have more, on a variety of topics, in the coming weeks. Although several of our posts have mentioned Jeannette Rankin and some of her contributions to the country, we’ve never explored the life and legacy of the first Congresswoman. So, as we celebrate Women’s History Month, let’s take a look at the life of this influential woman. Jeannette was born in Missoula, Montana on June 11, 1880, during the Gilded Age in America. Significant technological changes were taking place during this time; inventors and scientists were perfecting the use of electricity for purposes such as rail travel and lighting streets. The world was changing, and this was the perfect setting for Jeannette to grow and develop into the powerful woman that she would become. Coming from humble circumstances—her father a rancher and her mother a teacher—Jeannette learned in her youth how to work hard. She applied this to her education, attending Montana State University, New York School of Philanthropy, and the University of Washington. Before her entry into the political sphere, she tried several occupations, including teaching and social work. She also spent some time as a seamstress before realizing her passion for the suffrage movement. While living in Washington, Jeannette worked to change the state constitution to allow women the right to vote. Her hard work paid off in 1910, when Washington finally amended its constitution. Jeannette then took her social activism expertise back to Montana. Her efforts were successful once again: Montana granted women the right to vote in 1914. Once again applying her political prowess, Jeannette ran for the U.S. House of Representatives in 1916 for Montana’s At-Large district. According to the History of the House website, Jeannette “had two key advantages: her reputation as a suffragist and her politically well-connected brother, Wellington, who financed her campaign.” (1) These were certainly advantages to her campaign, but Jeannette also had a progressive platform, something that strongly appealed to the supporters of the suffrage movement. She was opinionated and unapologetic about her stance on war. Among other qualities, these advantages helped her to win one of Montana’s two seats and become the first female Member of Congress. Jeannette made significant contributions to the country during her two-year term in the House. For example, when President Wilson asked for a declaration of war on Germany, Jeannette adamantly voted in opposition. 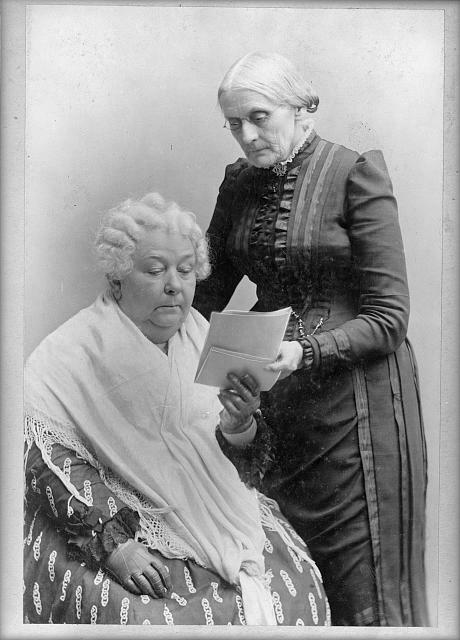 She also created legislation for women’s rights and helped to pass the Nineteenth Amendment. After her term ended in 1919, Rankin remained a proponent of pacifism and women’s rights. Later in life, when she was about 60 years old, Rankin took her seat for a second term in the House, this time representing Montana’s first district. It was during this term that she voted against American involvement in World War II, the only Member of Congress to do so. Although she proved herself to be true to her convictions, Jeannette received severe criticism for her negative vote. Her brother even stated, “Montana is 100 percent against you.” (2) Because of this opposition, she did not run for re-election in 1942, thus ending her formal political career. Because of her historic election to Congress and her dedication to the cause of women, Jeannette Rankin is currently honored in multiple ways. 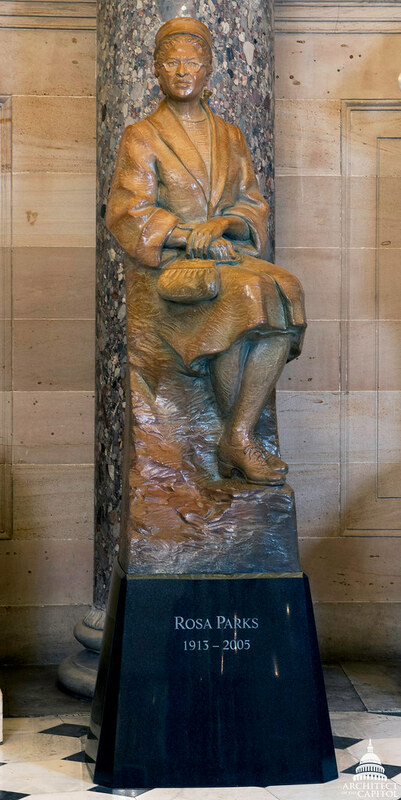 She has a namesake foundation that awards scholarships to “mature, unemployed women workers.” She also is memorialized by a statue in Statuary Hall. This month, as we recognize the powerful women in American history, let’s remember how Congresswoman Rankin paved the way for the future women of Congress. Do you have a favorite female Senator or Representative? Leave your thoughts in the comments! (1) History, Art & Archives, “Rankin, Jeannette.” http://history.house.gov/People/Listing/R/RANKIN,-Jeannette-(R000055)/. This week, a new figure joined the statuary pantheon in the Capitol. Political leaders of all stripes joined civil rights activists at the unveiling of a new statue depicting Rosa Parks. Parks will remain in National Statuary Hall, although the statue is part of the general Capitol Art Collection, as mandated by the legislation that initiated the creation of the statue. The addition of this work marks the first inclusion of a full-length statue of an African American (there are several busts) in the Capitol Art Collection. While we’ve generally covered Parks through an African American history lens, she serves as a bridge from February (African American History Month) to March (Women’s History Month). The story of America is still so often told through the stories of the leaders, the men, and the politicians, but so often the stories of the followers, the women, and the citizens are the ones that energize new generations and teach us about the fabric of the nation. For instance, discussion of the Montgomery Bus Boycott, which famously resulted from Parks’ refusal to change seats, frequently centers on the way the boycott invigorated a more national civil rights activism and brought leaders like Martin Luther King Jr. into the spotlight. All true, valid, and important. But the success of the boycott rode on the backs, and in the shoes, of Birmingham’s black women, who walked miles to their jobs rather than take buses. Without their determination and sacrifice, the civil rights movement would have needed a different catalyst. In a blog dedicated to Congressional and Capitol history, we too tend to focus on the leaders who seem to shape our world. That doesn’t mean, however, that we should forget the regular folks whose daily decisions can change the course of our history and the face of our culture. For more of our coverage of both black and women’s history, click on the categories tags in the byline at the top of this post. Editor’s note: February 4 marked the centennial of Rosa Park’s birth. Many of us are familiar with the name Rosa Parks yet unfamiliar with her continued efforts to end segregation. Rosa Parks was born Rosa McCauley on February 4, 1913 in Tuskegee, Alabama. Her mother was an Alabama school teacher and greatly valued education. Rosa eventually married Raymond Parks and they went on to become respected residents of Montgomery, Alabama, where she worked as a seamstress. At that time, Montgomery was governed by Jim Crow laws, which dictated which schools African Americans could attend, which water fountains they could drink from, and even which books they could read from the “black only” library. Rosa became the chapter secretary for the NAACP in December 1943. Over ten years later, Rosa was commuting home on a Montgomery bus that was often avoided by black residents due to the demeaning “Negroes-in-back” policy. The segregation laws at the time stated that front seats were reserved for white citizens, while the seats behind them were designated for black citizens. What many people don’t realize is that at the time Montgomery had contradicting laws on segregation. One law stated that segregation must be enforced at all times while another law stated that no person of any color could be asked to give up their seat even if there were no remaining seats on the bus. Parks was asked to give up her seat when a white citizen boarded the bus and no additional “white seats” were available. She refused and was taken into police custody shortly after. In Parks’ autobiography she writes, “People always say that I didn’t give up my seat because I was tired, but that isn’t true. I was not tired physically…No, the only tired I was, was tired of giving in”. In the years following the boycott, Parks and her husband decided to move to Detroit, where she was an administrative aide for Rep. John Conyers, Jr. until her retirement in 1988. During this time, Parks also co-founded the Rosa and Raymond Parks Institute for Self-Development as a youth outreach program. She spent time traveling to attend civil-rights events and received a Congressional Gold Medal. After her death in 2005, Parks was honored by Congress and became the first woman in history to lie in honor in the Capitol Rotunda. Congress has also commissioned a statue of her for its collections; it will be dedicated this month in National Statuary Hall. December 5th marks the 79th anniversary of the ratification of the 21st Amendment to the U.S. Constitution, which voided the 18th amendment, bringing to an end the era of prohibition in this country. As a majority of American adults do consume alcohol—though we consume far less than most other countries—and as the holiday season and all the food and drink that comes with it is now upon us, it seemed a good time to take a closer look at the rise and fall of prohibition in America. The temperance movement, which took hold in the mid- to late-19th century, actually has its roots in the abolitionist movement, with many of those who wanted slavery eradicated beginning to see the scourge of alcohol abuse and alcoholism as something also worthy of being abolished. Women were the original driving force behind the movement, since they viewed this as an issue that negatively impacted many families. While the temperance movement first urged moderation of drinking, it soon moved into calling for a full-fledged drinking ban. The two major groups to grow out of this movement were the Women’s Christian Temperance Union (WCTU) and the Anti-Saloon League (ASL), and both were strengthened by their alliances, with the WCTU forming a strong alliance with the leaders of the women’s suffrage movement and the ASL forming alliances with, well, anyone. Frances Willard, the dedicated leader of the WCTU, actually has her statue in the Capitol as part of the National Statuary Hall collection; it was the first statue of a woman to be accepted into the collection (it was given by Illinois in 1905) and it is also the only statue of a woman in the Old House Chamber, a nod to her prominent role as a grassroots activist. The Anti-Saloon League was and still is considered to be one of the most effective single issue lobbying organization in American history and brought together any and all groups (from the KKK to the NAACP) that wanted to achieve their ultimate goal, which was a constitutional amendment that banned the manufacture, transportation or sale of alcohol. By 1917, after the passage and implementation of a federal income tax, which many thought would greatly reduce the reliance of the federal government on liquor taxes, as well as increasing anti-German sentiment surrounding World War I (many of the Germans immigrants in the US were involved in beer brewing, a trade they brought with them from abroad), the calls for prohibition seemed to reach a fever pitch. On December 18, 1917, Congress passed a Joint Resolution to propose the 18th Amendment to the Constitution, which gave them seven years to have the states ratify it and stipulated that one year after ratification the law would go into effect. It would not, however, take seven years for the states to ratify the amendment; in fact, it only took only 13 months for that to happen. Then, at 12:01am on January 17, 1920, the 18th Amendment to the U.S. Constitution took effect. The unintended consequences of prohibition would not become immediately clear. As has been the case throughout our history, it is one thing to pass laws, but quite another to enforce them, and prohibition was no different; therefore, it was and still remains the job of to Congress to pass whatever other laws are necessary to ensure proper enforcement of said law. In order to enforce the 18th amendment, Congress passed the National Prohibition Act, more commonly referred to as the Volstead Act. The Volstead Act was actually passed after Congress overrode President Wilson’s veto in October 1919 and remained in effect until 1933 with the ratification of the 21st amendment. So, between the 18th amendment and the Volstead Act, what was the impact upon American society? Well, as anyone who has studied U.S. history or heard of Al Capone knows, the impacts were largely negative. While there were some indications of an early drop off in drinking and alcoholism rates, the void left from a lack of alcohol production, sales, and transport, not only had severe economic implications, but also led to the rise of gangsters and organized crime to occupy that empty space. Both laws created loopholes that many different groups worked to fill—bootleggers, pharmacists, home vintners, and the like, all looking to make themselves some money or get their hands on some booze. Corruption among police and politicians was on the rise during this era, as well. Bottom line: prohibition was a bust. After over a decade of being a “dry” country, on December 6, 1932, Senator John Blaine of Wisconsin submitted a resolution onto the floor of the Senate to submit the 21st amendment to the states for ratification, which followed in February 1933. That very same year, the 36th state, which was the last necessary one needed (and ironically ended up being Utah), ratified the 21st amendment at 5:32pm on December 5th, at which point President Franklin Delano Roosevelt, at 7pm on the same day, signed the amendment and ended the American experiment in prohibition. To put it lightly, the country was thrilled. While the intentions behind the 18th amendment were clearly good, the myriad negative consequences that came as a result of prohibition were just not worth keeping it as the law of the land. As the Chicago Tribune headline from December 5, 1933 read: “14-Year Dry Era Ends Today: Chicago To Give Legal Liquor a Gay Welcome.” This experiment, as it was, lasted 13 years, 10 months, and 19 days before it came to an end, and huge crowds greeted its demise at bars in cities throughout the country. These days in Washington, D.C., and throughout the country for that matter, it is increasingly difficult to get folks to agree on much of anything, but I have a sneaking suspicion that they’d all agree that prohibition was not a good idea and that they’re happy it came to an end. So, raise a glass with me this holiday season as we cheer the ratification of the 21st amendment and the end of the so-called “noble experiment” that was a dry America. Cheers!